We are champions of our own heart conditions. We are champions in our sports. We are champions for change. 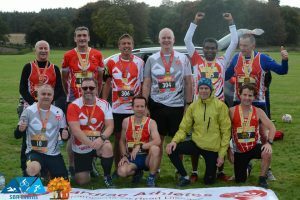 We love life and celebrate it through our sports and athletics, raising money for heart charities and have a blast in the process. We share our knowledge freely with each other. The knowledge pool grows exponentially with every new member that joins our ranks. We are not really competing with each other, we are competing with heart disease. We will beat it. We control it, it no longer controls us. Collectively we are stronger. If we are feeling depressed we share our demons and our stronger upbeat team members help us dismember them until they are gone. We know more about the heart, exercise, nutrition, rest and recovery than the average Joes out there. They are the high-risk runners attempting their first marathons. Not us. We have had all the tests, all the screening, all the operations and procedures for our hearts. We know precisely where overtraining and overreaching is for our bodies and hearts and lungs. You don’t! We are the low-risk competitors. You are at a higher risk of sudden cardiac death than us because you have never had an echo, never had a stress ECG test. Many of our Ambassadors are BLS and CPR trained ready to help any of their running buddies if they suddenly experience chest tightness. 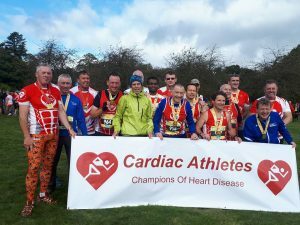 Cardiac Athletes are winning medals and trophies every day and every weekend of every month right across the globe. We are not satisfied with this though. No, we want more. The world has to change. The world needs to wake up first (hence our bright eye-catching conversational team kit). This world needs to catch up with us and our achievements. We want more Sports Cardiology, more Sports Cardiologists, more Sports Cardiology Clinics … right now! We could even have a real World Heart Games right now because there are so many great heart athletes all over the world. If you don’t believe that statement, go check out our expanding World Record holders. We need to have zero tolerance for heart disease. Together if we all worked together, we could eradicate it once and for all.